My homemade Italian fennel sausage with chilli recipe comes with a hearty recommendation. I made a batch for a catering gig that I was doing locally and a couple of people came over for a taste. "Ah but it is the real deal?" they asked. "We've just come back from Italy and we know what we're talking about". Well that's good enough for me! And what's great about this homemade Italian fennel sausage recipe with chilli is that the list of ingredients is really simple. No one seems to know the origins of fennel and chilli as a flavour combination but suffice to say it's classically Italian. One option doesn't even involve the casings, just use the fennel and chilli sausage meat to stuff ravioli but my favourite way to eat my homemade Italian fennel sausage with chilli is to gently grill it and then slice into a rich tomato sauce and serve with spaghetti. I've included a quick recipe in the cooking instructions below. You'll need to prepare approximately 4m or 16 feet of hog casing to complete this recipe. Learn more about preparing casings. Place the dry seasoning ingredients in a pestle and mortar and give them a good pound so that you break up the fennel seed a little. Mix the crushed seasoning ingredients together in the ice cold water and make sure that all the salt has dissolved. When complete, place this mix in the refrigerator to keep chilled. Cut the pork shoulder and the belly pork into 1" pieces and run through the grinder using a medium plate (about 5mm) and then return to the refrigerator for ½ hour to ensure that everything is chilled. When your stuffer is set up, mix the meat and seasoning together in a bowl and then knead for 5 minutes to ensure that you have an even distribution of seasonings through the meat. The final stage before stuffing is to run the ground meat through the grinder one more time using the same sized plate and then place your meat in the stuffer. Give the meat a good pounding with your fist to ensure that there are no air pockets remaining in the stuffer barrel. Stuff the meat into your casings and make links at 10cm or 4 inch intervals. Place the links in a dish, cover with paper towel and refrigerate overnight to allow for complete dispersal of the seasoning. This homemade Italian fennel sausage with chilli is the perfect ingredient to add to any pasta dish. Fry off some chopped onion and sliced fresh fennel in olive oil for 5 minutes. Add a chopped clove of garlic and after a further 1 minute of cooking, pour in a can of chopped tomatoes. Simmer for 10 - 15 minutes to allow to reduce and thicken, take it off the heat when you reach the consistency you like. 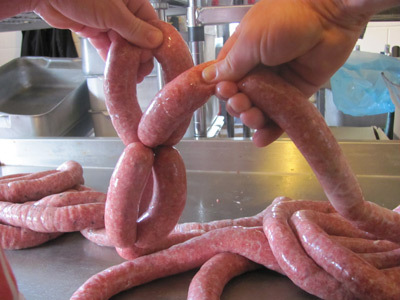 Remove your sausage from the heat when the internal temperature reads 70°C or 160°F and allow to rest for 10 minutes. Cook your pasta until al dente. Heat up your sauce (if necessary), slice the sausage and add it to the sauce, next add the pasta to the sauce and toss it all together over a low heat for about a minute. Add a splash of the pasta water and turn up the heat for 30 seconds. Note: I'm not the pasta cooking expert but I found this article really helpful. Finally some grated Pecorino Romano or Parmigiano and you're ready to serve.